It is up to the self-builder as to how much he uses an architect during the build of his home. An architect’s charges are not low and it is advisable to always check whether the one that is picked for the job is worthy of his charges. It is generally thought that you need an architect to design a house and draw the plans ready for submitting to the planning department of the local council. This is not necessarily so, if you have the initiative to self-build a house and learn skills for that purpose you could also learn how to draw plans and design a home. Let’s face it you know what you require for your perfect home it is only a matter of putting these ideas down on paper in such a way that they are understood by the builder and the planning department. With computer programmes being so widely available for most tasks it will come as no surprise that you can also obtain one to turn your ideas into suitable plans. What you are buying from an architect is his knowledge and the protection of the association to which he is affiliated. This governing body ensures that the architect is qualified to practise his trade. It can also arbitrate if it is found that the architect has been negligent in his advice. An architect will send in the plans for inspection to the local planning office he will also send copies to the building control department. These are the people who will visit your site at certain stages in order to check that the work had been done correctly before you can move to the next stage. Ensure that the copies of the plans you are working to have been authorised by both departments of the council. If you are borrowing money from a bank or building society they will require certificates to prove that the build has not only reached certain stages but has been built correctly. It is the architect that will supply these certificates. It is advisable to keep these certificates as they can be shown to prospective buyers if you choose to sell the house at some point after it has been built. The architect can also do the job as the project manager of the build if you cannot do the job yourself. This could be a costly addition to the build and should be thought about carefully before you make a decision. 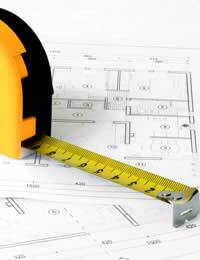 The architect will also know of contractors that he has worked with on other projects that he could recommend to you. Always check out any recommendation carefully before hiring someone. Within the architects office there will be someone with quantity surveying qualifications. If you are unable to cost the build yourself at a price, this can be done for you. If anything within the build goes wrong remember that the buck stops with you. If the fault is with the work of the architect then you can go to his governing body for help and if the problem is serious he will be struck off and will find it hard to find work with no membership letters after his name. Remember also that you can take the architect to court if he has caused your build to fall foul of the planners due to his negligence. Using an architect is entirely up to the individual builder and the way in which he wants to control the build.